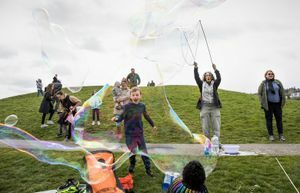 It makes sense, supporters say, to connect Seattle’s two streetcar lines — in South Lake Union and First Hill — completing a route that could eventually take residents and tourists from the Olympic Sculpture Park on the waterfront to Volunteer Park on North Capitol Hill. The city continues to plan for that but doesn’t yet know how that connection will be made, or which route it might take. Mayor Mike McGinn and Councilmember Richard Conlin will be on hand for an open house Wednesday evening to take public comments on the options. Although a streetcar line through downtown seems the most likely, the $900,000 federal grant the city received for planning requires officials to consider alternate routes and modes. City Councilmember Tom Rasmussen, chairman of the Council Transportation Committee, said a likely alternative would be the existing electric-bus trolley lines. “They’re already in place and they’re part of a much larger network,” he said. The city has proposed a route going northbound on Fourth Avenue and Southbound on Fifth Avenue. The other option is a route going in both directions along First Avenue, where there is less car and bus traffic. A coalition of neighborhood groups and downtown institutions including Pike Place Market and the Seattle Art Museum favor the First Avenue option. “It’s a great route that could connect multiple destinations from Capitol Hill to Pioneer Square to the Market. Right now, that’s hard to do without a car,” said Ben Franz-Knight, executive director of the Pike Place Market Preservation and Development Authority and the chairman of the Streetcar Coalition, a group that is advising the city on possible lines. A downtown link also would make it easy for patients at cancer-care clinics in South Lake Union or workers in that neighborhood to get to Pioneer Square or the hospitals on First Hill. City officials hope to complete the study in 14 to 18 months. A preferred route, though, would be selected by the end of the year with an implementation and finance plan sent to the City Council by early 2014. The city hopes the advanced planning will position it for additional federal transit dollars. City voters last year turned down a $60 car-tab measure that would have directed $18 million toward planning four new streetcar lines.